OLLIE: Two hundred and sixty-five! STAN: Two hundred and seventy! OLLIE: Two hundred and ... What are you bidding against me for!? STAN: Well, you're bidding against me! Two hundred and seventy-five! I had strange, mixed feelings about the artifacts, costumes and papers displayed in the gallery. On the one hand, they were all just things. For instance, a wicker chair looked rather cheap and almost ugly, something I could buy in any thrift shop for a few dollars. However, when a Christie's employee named Gail directed me to look at the photo displayed with the chair, I actually got chills. It was from the set of Casablanca. Suddenly, it meant something. This was a chair from Rick's Place - this was Bogey's chair! Naturally, I spent most of my time inspecting the Stan Laurel collection. 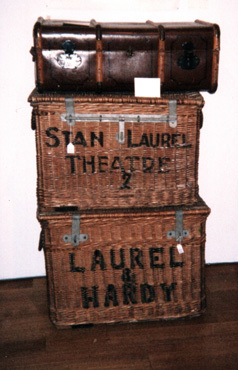 Although I have been to the American Museum of the Moving Image in my home town of Astoria, New York on several occasions, they never had any Laurel and Hardy stuff on any of my visits, so this was the first time I ever had the chance to see anything that once belonged to either of The Boys up close. Gail became my de facto guide and was kind enough to actually remove some items from their glass showcases so I could inspect them even closer. Thus I got an up close look at one of Stan's bowler hats as well as a polka-dotted bow tie. To my eyes, the hat was flatter and less dignified than the ones we normally associate with Stan in the movies, and my educated guess would be that it may have been one he wore in later live appearances. While I was formulating this theory, another part of my brain was thinking "This is Stan's hat. What are the chances of me slapping this on my head, running out of Christie's as fast as I can and hitting the train station before security can catch up to me and tackle me to the ground?". Of course, that plan hinged upon a train just pulling into the station, and as every New Yorker knows, when you arrive at a subway station, trains are never just pulling in, they are always just pulling out. So, instead, I gave up any thoughts about beginning a life of crime and snapped the picture above instead. 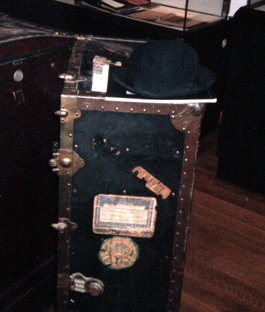 It shows Stan's bowler hat resting on top of a metal wardrobe trunk used by Laurel and Hardy on their various European tours. "Do I have time to remove my stockings?" "Hell, you have time to knit a pair!" Also on display were various letters and photographs from famous friends and admirers (President Kennedy, Jerry Lewis, Lucille Ball), personal papers, certificates and identification cards including a "Motion Picture Employee" ID card from 1942 with Stan's photo, social security number and two signatures, one of each side. The wicker hampers and trunk pictured on the left brought a flood of images in my mind of Stan and Ollie traveling here and there for one of their live shows. The line that stuck in my head while looking at these comes from their short Beau Hunks: "Traveled all over the world - loved by everyone." I did spend some time looking at non-Laurel and Hardy artifacts. Seeing Captain James T. Kirk's chair up close from the set of the original Star Trek series, I had an urge to park myself in it and say "Not chess, Mr. Spock - poker!". (Trekkers, name that episode!). I assumed Christie's security would frown upon such an action so I refrained. 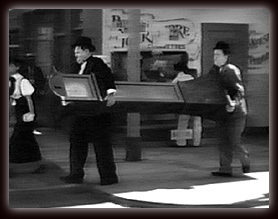 Instead, I walked over to a glass case and viewed a straw hat that once belonged to Buster Keaton, along with a letter signed by Keaton and Donald O'Connor, who played Keaton in the well-meaning but ill-advised The Buster Keaton Story. Of course, it was simply a straw hat, somewhat yellowed with age, but again, there was that thought - "This is Buster Keaton's hat!". There were costumes galore, once worn by such luminaries as Audrey Hepburn, Vivien Leigh, Al Pacino and Marilyn Monroe. Vintage film posters decorated the walls, including a beautiful one-sheet poster from 1964 for The Beatles A Hard Day's Night which, somehow fittingly, hung directly above Stan Laurel's wicker hampers and trunk. B.S. 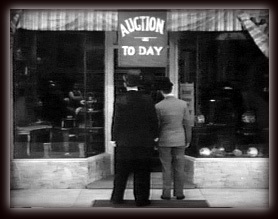 (June 5th) - The auction was a success, with most if not all of Stan's stuff being bought by private collectors. Stan's bowler hat went for an astounding $26,400! As Chubby Chaney said in the Our Gang short Bargain Day, "Now that's what I call a hat!" Copyright © John Larrabee, John V. Brennan, 2007. All Rights Reserved.